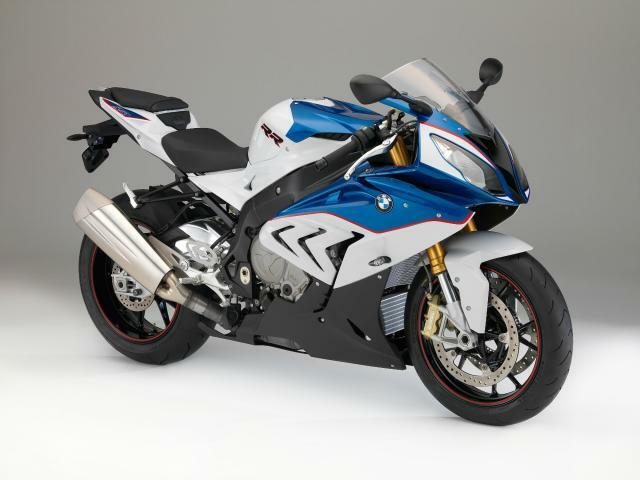 BMW HAS just unveiled its revised 2015 S1000RR, with power up 6hp to 199hp and weight down 4kg to 204kg fully fuelled. The German firm's flagship sports bike has been given a lighter frame and chassis geometry tweaks aimed at improving handling and feedback. Torque has been increased at over 5,000rpm, with a peak of 83lbft and a 'wide torque plateau' between 9,500 and 12,000rpm, according to BMW. Styling has been updated, with new bodywork and the trademark asymmetrical headlights swapped around to make it 'recognisable as new at first glance'. Three-mode traction control and race ABS are standard. A further two riding modes and BMW's Dynamic Damping Control semi-active suspension, previously found on the high-spec HP4 version, are available as an option. The optional extra electronics package also includes 'launch control' for 'flawless racing starts', plus a pit-lane speed limiter. Other options include cruise control, a first for a superbike according to BMW. The new S1000RR comes in red and white, metallic black or 'BMW Motorsport' colours. 'The new BMW S 1000 RR – the ultimate sports companion. The new BMW S 1000 RR is receiving its world premiere at the Intermot 2014 motorcycle fair. With refined torque delivery and peak torque of 113 Nm (83 lb-ft), an increase in engine output of 4 kW (6 hp) to 146 kW (199 hp), plus a reduction in weight of 4 kg to 204 kg with a full tank of fuel and Race ABS (making allowances for equipment), the superbike that first debuted in 2009 is entering a new generation. Besides eliciting even sharper performance from the new S 1000 RR, particular attention was also paid to designing the bike to be even more rider-friendly. Whether it is used for everyday riding, flitting through bends on country roads or being put through its paces on the race track – the new S 1000 RR excels in every respect. Optimised drivetrain for even greater performance and rideability. The enhanced performance of the new RR in terms of drive power can be attributed to the re-engineered cylinder head with new duct geometry, new intake camshaft and even lighter intake valves. Furthermore, an airbox with a modified capacity combines with an intake system with shorter intake lengths to make mixture preparation more effective than ever and give the new S 1000 RR added punch. A further key contributing factor to the improvement in power and torque characteristics is the new exhaust system, which now dispenses with a front silencer and weighs around 3 kg lighter. Rideability and response from standstill both benefit from an increase in torque upwards of approx. 5,000 rpm, a more linear torque curve, as well as a wide torque plateau that allows the rider to summon up almost maximum pulling power between 9,500 (112 Nm) and 12,000 rpm (113 Nm / 83 lb-ft). New frame structure and chassis geometry for superior riding precision and even better handling. Further improved Dynamic Damping Control (DDC) from the HP4 as an ex-works option. Chassis-wise, the new RR has been honed with the introduction of a new, lighter frame structure offering an optimised blend of rigidity and flexibility. Together with the optimised chassis geometry featuring redefined values for the steering head angle, wheel castor, wheelbase and swingarm pivot point, it promises even better handling, increased traction and unequivocal feedback, particularly when riding at the limit. The tasks of wheel suspension and damping continue to be performed by fully adjustable spring elements, but with modified negative spring travel for more banking clearance and greater agility. As a factory-fitted option, the new S 1000 RR can also be specified with the new improved version of the electronically controlled Dynamic Damping Control (DDC) suspension – already familiar from the HP4 – that provides the basis for a chassis set-up with absolutely no compromises. Three riding modes as standard, plus two more available for fine- tuned adjustment by opting for the Pro riding mode feature. To enable optimum adaptation to the prevailing riding conditions, the new RR bike already comes with three riding modes as standard: “Rain”, “Sport” and “Race”. If the Pro riding mode option is selected, these can be supplemented by the two additional modes “Slick” and “User”. The Pro riding mode option also features Launch Control for flawless racing starts as well as the programmable pit-lane speed limiter for sticking exactly to the pit-lane speed limit. When this feature is activated, it has the additional effect of producing the impressive soundtrack familiar from the world of motorcycle racing. The HP Gear Shift Assist Pro, which can likewise be ordered as an ex-works option, enables lightning-fast clutchless upshifting and downshifting. Refined control system set-up. Dynamic Traction Control (DTC) with precision calibration in seven +/- steps. The new RR already leaves the factory with Race ABS (semi-integral) as well as Automatic Stability Control (ASC) included as standard. In conjunction with the optional Pro riding mode feature, it can be equipped with Dynamic Traction Control (DTC) including banking sensor and precision calibration. All control systems have been retuned and further improved in terms of their control precision and characteristics. First ever superbike with cruise control (optional). Innovative instrument cluster design, new electrical system and lighter battery. For the first time, the RR is now also available with an electronic speed control for staying within the current speed limits (ex-works option). The multifunctional instrument cluster comprises a new dial for the analogue rev counter as well as a redesigned LCD display offering a far greater array of functions. The new S 1000 RR furthermore features a new electrical system and a more powerful sensor box, along with a smaller battery weighing around 1 kg less. Design that is more dynamic than ever with stunning colour schemes. Last, but by no means least, there is the completely restyled bodywork that speaks an even more dynamic design language. The principle of the asymmetric headlight arrangement on the outgoing model has been retained as a characteristic distinguishing feature, yet the headlights have been repositioned and restyled to ensure that the new RR is recognisable as “new” at first glance. The dynamic design with its sporty, aggressive feel is given further impact by colour schemes with three very individual characters: Racing Red / Light White, Black Storm metallic and the BMW Motorsport colours. • Increased power output and torque: 146 kW (199 hp) at 13,500 rpm and 113 Nm (83 lb-ft) at 10,500 rpm. • Even better rideability thanks to increased torque from approx. 5,000 rpm upwards as well as a more linear curve. A broad plateau of peak torque available in the rev range from around 9,500 up to 12,000 rpm. • Re-engineered cylinder head with new duct geometry, new intake camshaft and even lighter intake valves. • New intake system with shorter intake lengths, larger airbox and full E-gas ride-by-wire. • Reduction in weight of 4 kilograms to 204 kg with a full tank of fuel (making allowances for equipment). • New exhaust system weighing around 3 kilograms lighter without a front silencer. • Riding modes “Rain”, “Sport” and “Race” as standard plus the option of the Pro riding mode with two additional modes, “Slick” and “User” (configurable), for optimum adaptation to riding conditions. • Launch Control for flawless starts as part of the optional Pro riding mode feature. • Pit-lane speed limiter for maintaining an exact speed in the pit lane as part of the optional Pro riding mode feature. • New, lighter frame structure with an optimised blend of rigidity and flexibility for more traction, greater precision and clear feedback. • Refined chassis geometry for even better handling, increased traction and unequivocal feedback at the limits of performance. • Fully adjustable spring elements with optimised negative spring travel for more banking clearance and greater agility. • Further improved version of electronic Dynamic Damping Control (DDC), familiar from the HP4, as an ex-works option. • Race ABS with optimised set-up. • DTC traction control with precision calibration in 7 +/- steps. • HP Gear Shift Assist Pro for fast clutchless upshifting and downshifting as an ex-works option. • New electrical system with a more powerful sensor box and lighter battery. • Electronic speed control as an ex-works option. • More sophisticated instrument cluster with extended array of functions and wide variety of information. • Completely restyled bodywork for an even more dynamic design language. • Innovative colour schemes with three individual characters: Racing Red / Light White, Black Storm metallic and BMW Motorsport.